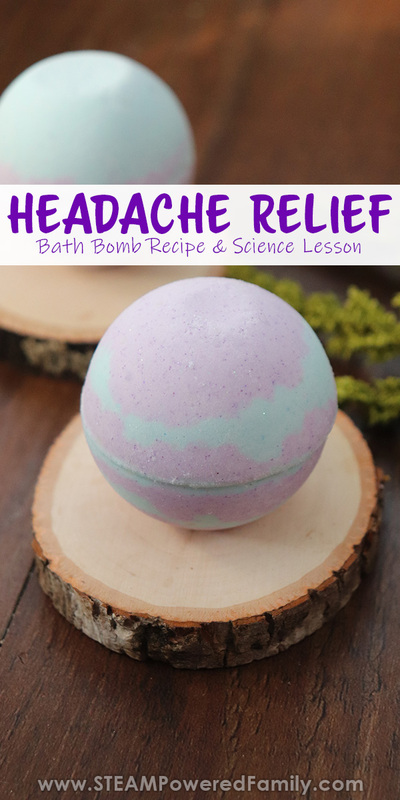 Headache relief bath bomb recipe that includes a bath bomb chemistry lesson for kids. 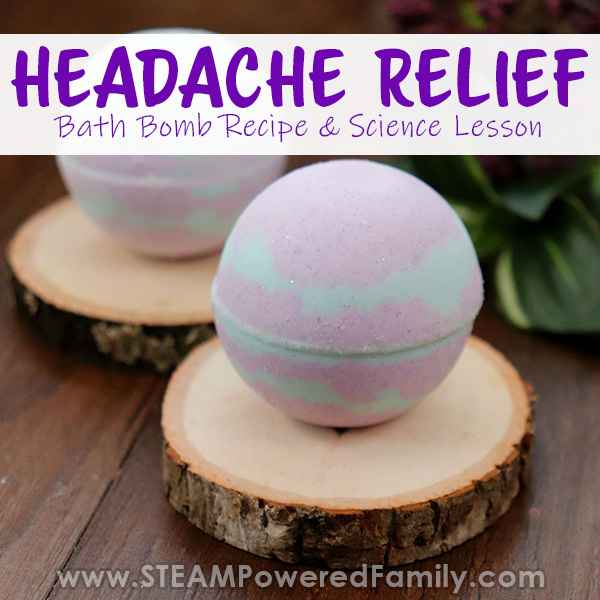 Learn not only how to make bath bombs but the chemical reactions that give them that wonderful fizz! Lately we have been experiencing some crazy weather. Barometric changes mean one thing around here, headaches. It’s also insanely cold! So we decided it was time for some new bath bombs, this time with a nice blend of scents to help ease our headaches. All everyone is talking about lately is this polar vortex. It’s cold, really, really cold. Which is actually fairly normal weather for us. We spend a lot of time in the -30C range between November and February. It’s why we always have so much winter science and winter STEM activities on here! So while the cold is a regular evil around here, what actually has been causing the biggest issue, is the way the weather fronts have been moving through. The rapid changes in weather are a major trigger for migraines with myself and my son. 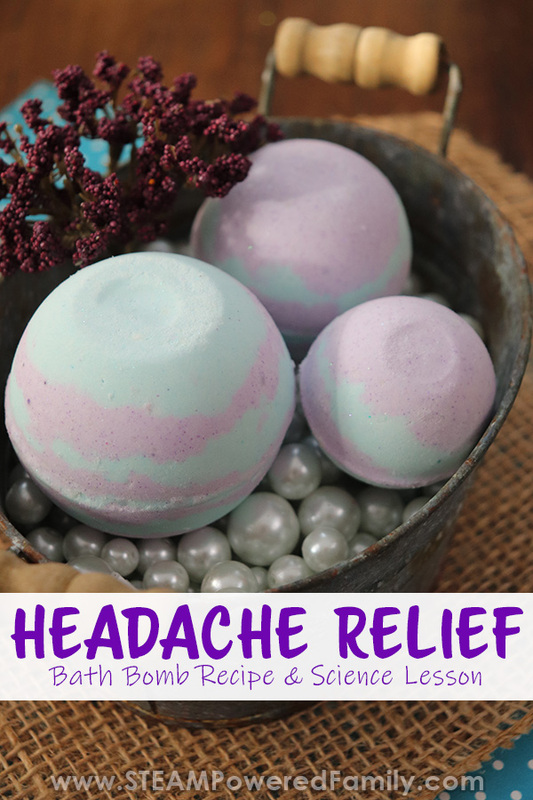 Why Headache relieving bath bombs? Recently, after many years on medication for Chronic Migraine Disorder, our Pediatric Neurologist decided my son was ready to try going off medication and using natural treatments and OTCs to try and control his migraines. This has involved some specific vitamin supplements, drinking plenty of water, dietary restrictions, exercise requirements, and some natural pain relievers for headaches. Things like massage, stretching, Japanese Mint Oil, lavender, etc. When it is this cold, it is also nice to have warm showers and baths. So naturally, this means it’s time for some chemistry to create some new bath bombs! 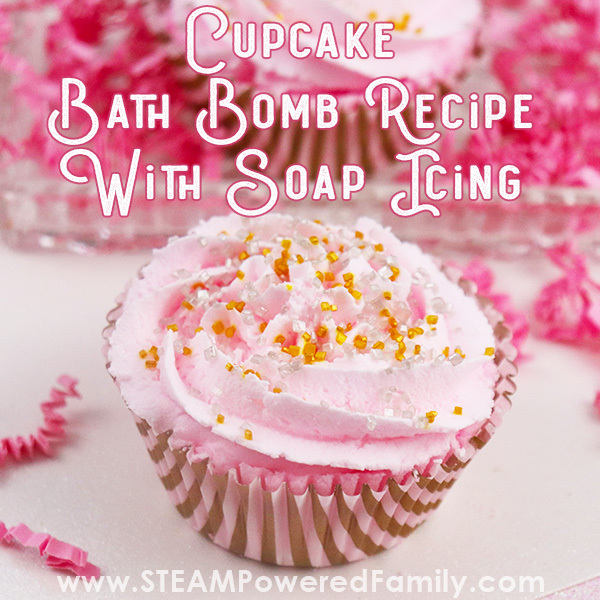 Here are our step by step directions on how to make bath bombs. 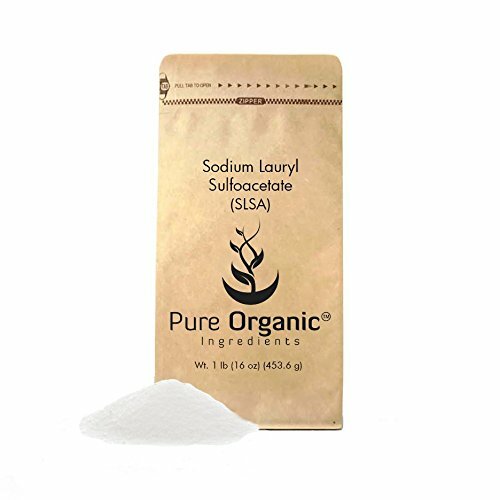 In a large bowl add the baking soda, citric acid, cornstarch, SLSA, epsom salts and the dried lavender. Stir gently. 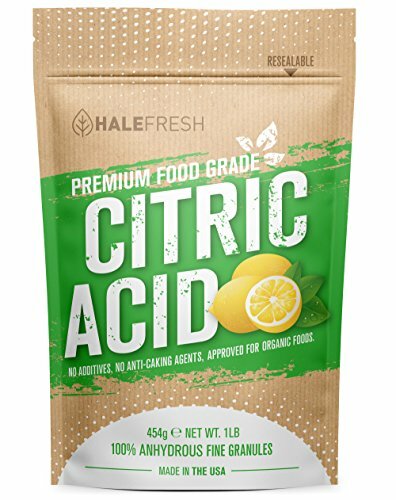 Citric acid can irritate the sinuses if it is inhaled. 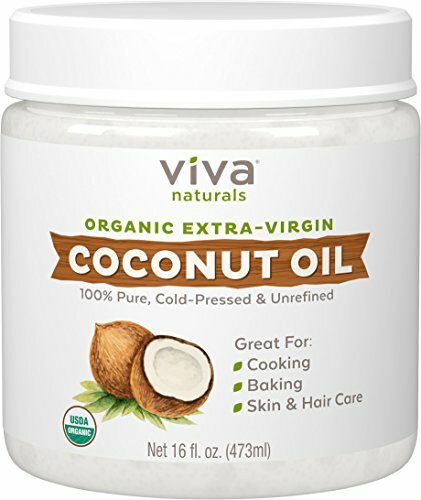 In a small microwave safe container melt the coconut oil until it is liquid. Add the essential oils and polysorbate 80. Blend together. Feel free to adjust the essential oils to meet your preferences. I also find citrus works very well on headaches even though we didn’t use it in this batch. 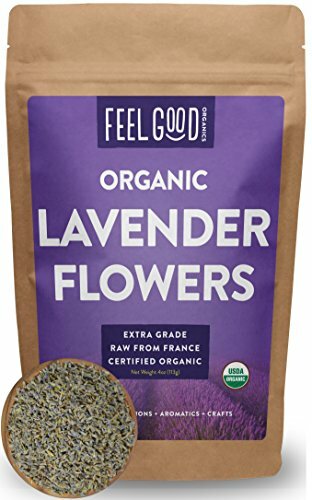 But also, just lavender by itself is amazing at helping to relieve our headaches. Add the wet ingredients to the large bowl with the dry ingredients and mix together well. I recommend putting on some gloves and using your hands to really mix it all in. You want it to stick together like wet sand. If the air in your home is particularly dry you may need to add more coconut oil. 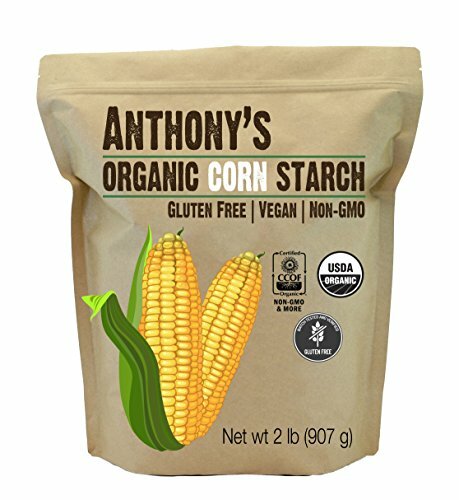 Add only a teaspoon at a time and blend in really well until you reach the desired consistency. Divide your mix in two bowls. 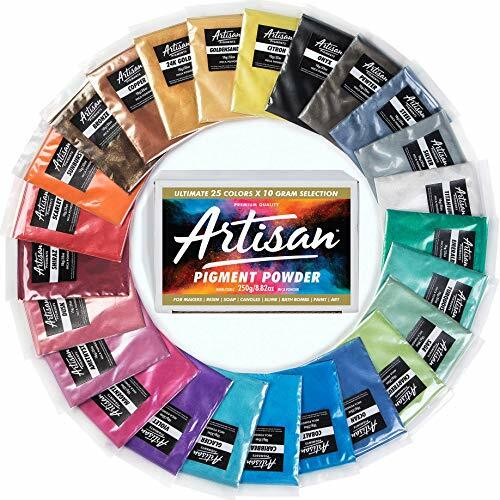 Add 1/2 teaspoon of purple mica powder to one and teal to the other one. Mix well. 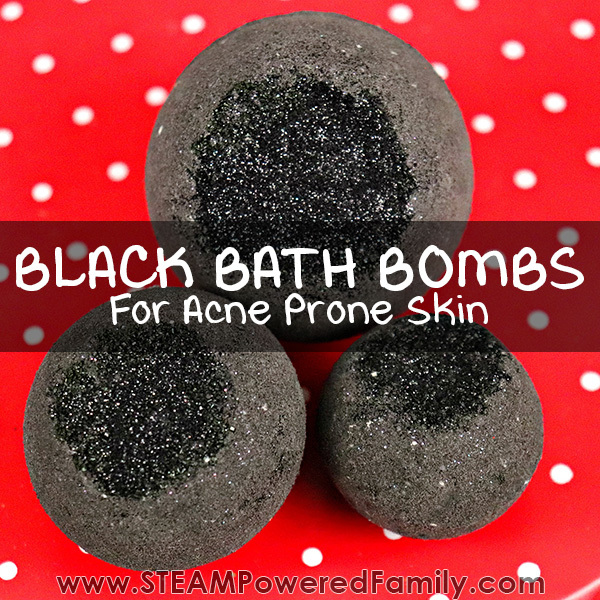 If you want your bath bombs darker in colour, you can add more mica powder. But too much mica will create a mess in the tub. A little goes a LONG way. Side note: You don’t need to use two colours. Feel free to use just one colour and simplify the creation process. Loosely mound the bath bomb mixture into both halves of the bath bomb mold. To get the layered look simply add a bit of purple, then a bit of teal, then a bit of purple. Once you have them nicely heaped up, bring the halves together and twist until the edges touch and all excess falls back into the bowl. Gently tap the ends of the mold, then carefully pop the bath bomb out of the mold. Set it somewhere warm and dry, and allow it to set overnight. This is the best part! Now just run a nice warm bath, dim the lights if they are bothering your head, then climb in and drop one bath bomb into your bath. It will fizz and bubble releasing the scents of the essential oil blend. Inhale the aromas and let them calm your headache. 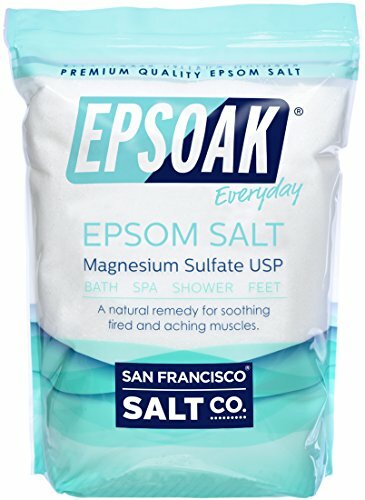 The magnesium in the Epsom salts is also helpful with headaches. Plus, the warm bath will help relax any tension which will also help with the headache. Take this time to rest and let your body and mind become still and calm. Hopefully after about 20 minutes your headache will be much better. As you are resting in the fragrant waters of the bath you have created, you may be wondering what exactly is causing that bath bomb to react and fizz. This is the part we love, the chemistry! 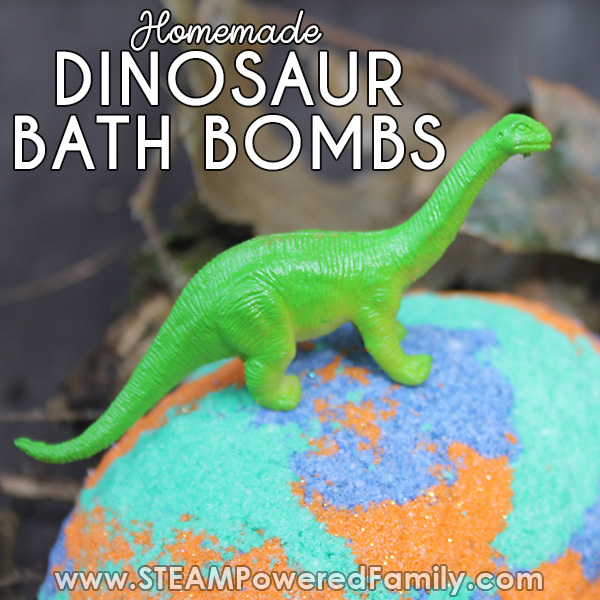 Bath bombs are an acid-base reaction. 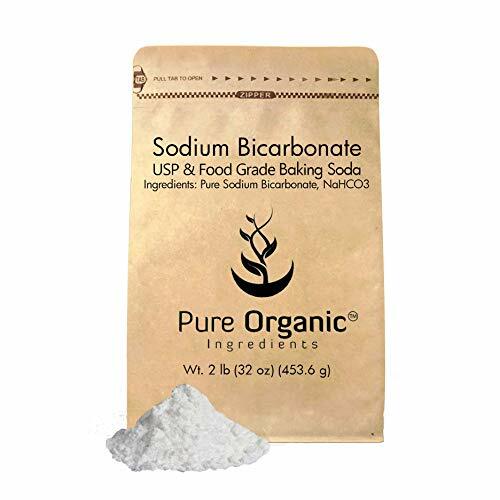 Our acid is Citric Acid and our base is Baking Soda (sodium bicarbonate). When dry they can be mixed with no noticeable reaction. But add water and a reaction is triggered! Just like in our bottle rockets and magic colour changing oobleck, we get a wonderful fizzy reaction that releases a gas, Carbon Dioxide (CO2). We also have two other interesting ingredients in this recipe. SLSA and Polysorbate 80. 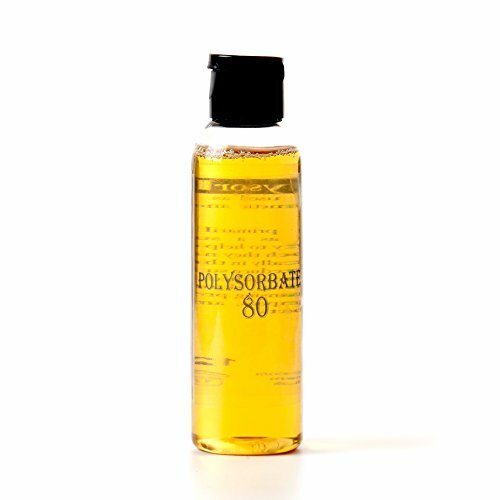 Polysorbate 80 is an emulsifier, which is required to make the oils in this recipe mix with the bath water. Without polysorbate 80 your bath bomb is going to become a bath “scum” with a nasty sludge floating on top of your bath water. And frankly, that is not going to help anyone’s headache. The last thing you want is to need a shower after your bath or have a huge mess to clean up in your bath tub. Next we have SLSA which is a surfactant. Unlike Polysorbate 80, SLSA is not required but it sure is nice to have. SLSA helps capture the CO2 and create a luxurious foam bath. It also helps slowly release the scent from the essential oils. This prolonged release will help with your headache better than a quick release of the scents. 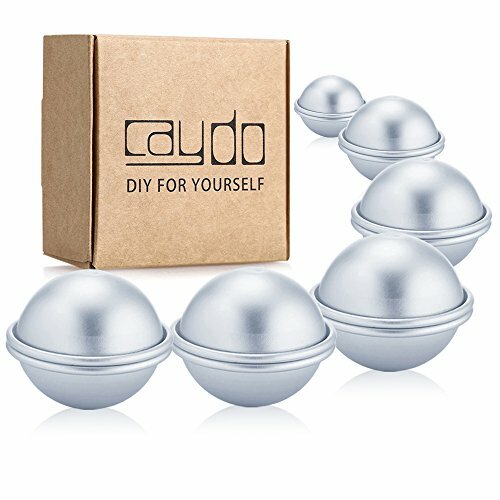 Enjoy your headache relief bath bomb! 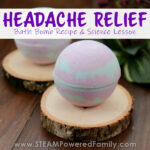 Headache relief bath bomb recipe that includes a bath bomb chemistry lesson for kids. 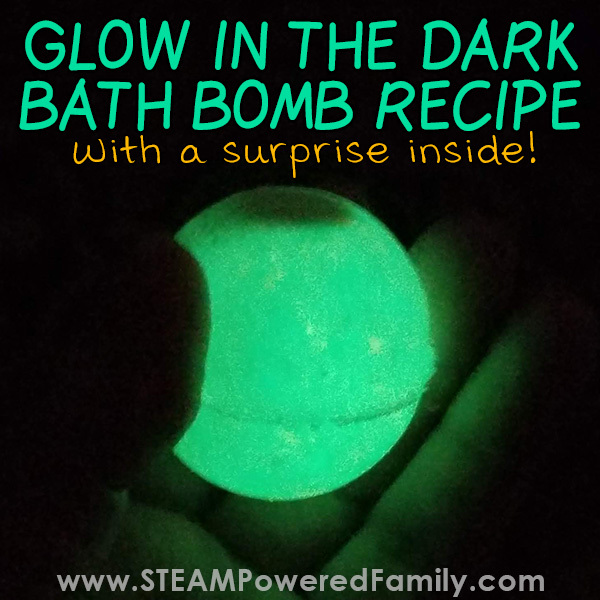 Learn not only how to make bath bombs but the chemical reactions that give them that wonderful fizz! This DIY Bath Bomb uses real lavender to relax and calm. Loosely mound the bath bomb mixture into both halves of the bath bomb mold. To get the layered look simply add a bit of purple, then a bit of teal, then a bit of purple. Once you have them nicely heaped up, bring the halves together and twist until the edges touch and all excess falls back into the bowl. Gently tap the ends of the mold, then carefully pop the bath bomb out of the mold. Set it somewhere warm and dry, and allow it to set overnight.